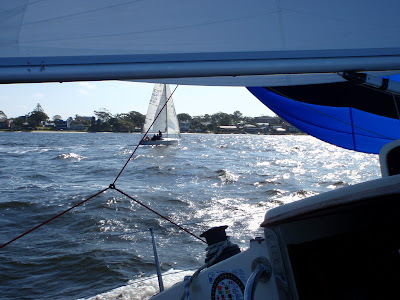 The day was warm, the water calm and the breeze all but a memory as Ruth and I drifted around the start area with the mainsheet in one hand and a beer in the other. An early tactical move saw Rogue Wave strategically place herself abeam of the boys on Chilli so they could gaze upon our refreshing cold ales! Our generous (or maybe devious) nature saw a few beers passed over to rail to distract the crew with 15 min to the gun. It was looking like a spinnaker start so I opted for the light Assy and a start at the leeward end of the line, whilst the majority of the fleet crammed the windward......if you could call it windward.....end of the line. We hoisted and drove over Goodlife2 with the speed of a startled gazelle, to be up at the front of the fleet after only 200m ....and then disaster......the breeze backed 90 degrees in a heartbeat and stuffed us royally!! At one stage Ruth disappeared under the red/white/blue spinnaker as it blew through the fore-triangle; so a quick drop was called for as we drifted back into the fleet. We were not alone as several others had the same misfortune. Phopar #1. This little episode cost us time so we chased down the fleet under white sails as the breeze started to fill in. By the time we hit Wedding Cake we were about 3rd around the mark. In the light air I opted for the 0.75oz Symmetrical spinnaker as we needed to run downwind back to Middle Island. Ruth took the helm whilst skip did the foredecky pole dance to set the spinnaker.......two more crew would be extremely handy! Preparing for the gybe things went a tad squirrily as we started to run out of wet stuff. The gybe was called and the spinnaker promptly collapsed and blew through the fore-triangle.........and then reset itself and we powered along! So we gybed the main and reached out of the shallow water before running square and sorting out the mess. Phopar #2. We managed to stay ahead of Goodlife2 such was the lead we had pulled out, but Anneliese and Nelson J slipped ahead. 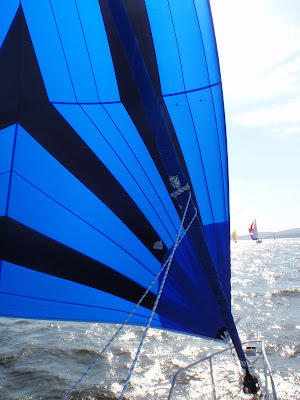 We gained ground on the beat and set our third spinnaker for the day (1.5oz Assy) for the two reaching legs. By now the breeze had reached a steady 12-15 gusting to 18 knots so we were keen to get the Assy up gain some ground. The set went well and we were away at over 7 knots......only to look behind and see the big 39ft Beneteau with masthead spinnaker bearing down on us. They drove over us just in time to drop in front and gybe the mark. We gybed the Salamander Mark for the reach to the finish. We made ground on Anneliese and passed Nelson J (spinnaker problems) but could only hold ground with Goodlife2. Nelson J had a great race and it was unfortunate they had spinnaker problems on the final reaches. Another great day on the water and a cold ale passed the lips on the motorsail back to the mooring. All was not as it seemed though......Ruth picked up a change in exhaust note that results from a dry exhaust. A quick check below revealed a bilge filling with clean seawater indicating a problem with the raw water side of the engine cooling system. We limped back to the mooring and tidied up the mess. The problem was easily fixed by making a better mousetrap.....by that I mean the retainer that held the coolant pipe in the heat exchanger had worn through vibration so I improved the design. Phopar #3. The results were disappointing for the 9-11m boats. Goodlife 2 (who is still sporting a very generous handicap) scored 4th whilst Anneliese was 9th and Rogue Wave 10th. The good news is we still hold 2nd place in the Summer Series and have moved into 5th position on the Cub Championship ladder. Great effort by the crew of Rogue Wave!